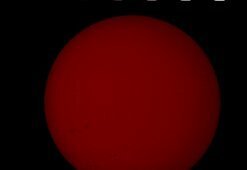 First attempts at solar photography. These were taken using the canon SLR & kodak Ultra 2 film attached directly behind a H-alpha filter. Dated on the weekend of the 1st of september sunspot groups 39 & 40 ( the larger group on the lower left can be seen traversing the disk. 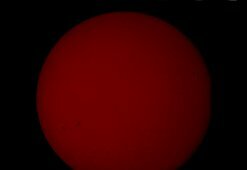 These are taken using Worcester Astro Societies H-alpha filter. I think I have slightly under-exposed these. No alteratins to the images have been made, & these have been scanned in directly from the negatives. On the 30th of october 2003, one of the largest collection of sunspots was observed, ( which would on the 4th of november produce the most powerful CME yet recorded ) . 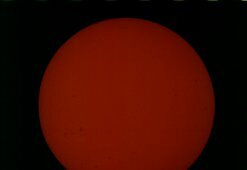 Using eyepiece projection through my refractor onto a hastily created board with white A4 paper stuck onto it , I was able to create some crystal clear images of the sun, and it certainly looked absolutely fantastic. 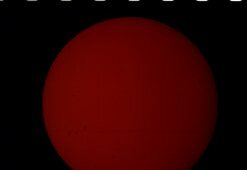 The images were taken around 10:00 , when the sun was not too high. I did not have the opportunity to attempt this at lunchtime when it would have been higher, but the results , visually at least were very good. A map of the sunspot numbers. and here is the image , taken with a canon A40. How I ever survived without my ngfs focusser, I do not know. It really is most excellant.